The Cosworth Pectel SQ6M eliminates the need for separate devices to control boost. One box does everything from water inection, intercooler spay, traction control, knock control, NTK Wideband or simple Lambda etc. If the wastegate and turbo are sized correctly Closed Loop Phase / Antiphase boost control can give 0030 mbar accuracy and no overshoot. In restricted engines this gives you the abilty to optimize boost v. impeller speed so the turbo is working in its best efficiency area and the density is at its highest and charge temps are not that high because of cavitation. With testing you can run more ignition and safer boost levels and attain more response because you are not working the turbo beyond its limits. CalTool 3.6 software allows you absolute control over your turbocharger strategy. Two three port 12VDc solenoids are used (MAC or Humphrey). One for Phase and the other for Antiphase. Be sure they have a large enough flow coefficient (Cv) and that they have 1/4" NPT ports. 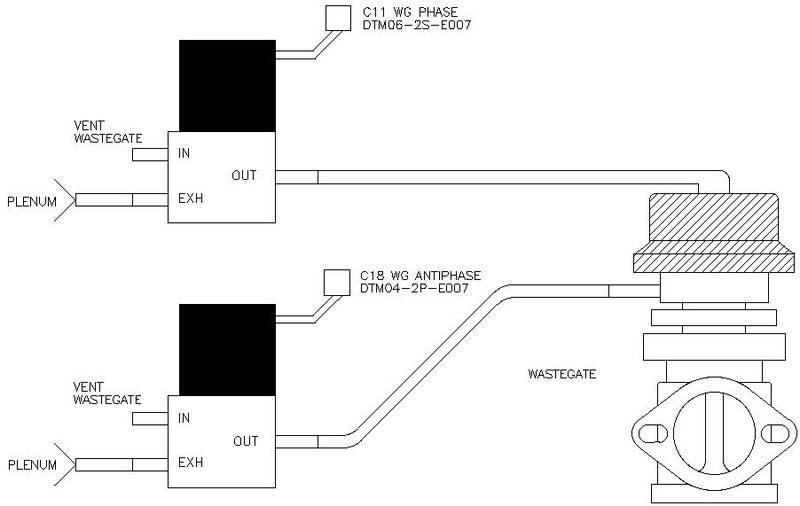 You should reverse the connector scheme on one of the solenoids so they cannot be mixed up. In the example above one solenoid uses pins and the other sockets. Use two separate points (2X) for the pressure (boost) supply as pressure is always, somewhere, "vented off". In theory it is possible for the supply to be vented rather than directed to the correct solenoid/wastegate port, especially around a 50% duty cycle. Lines can be as small as AN3 or, more typically, AN4 (1/4"). The solenoids are plumbed so that, when the solenoids are "off", the boost goes directly to the wastegate's middle and top ports. When the solenoids are "on" the boost pressure from the turbo is blocked and the wastegate's middle and top ports are vented to air. Varying the on/off duty cycle allows control between fully shut and fully open. The solenoids are typically programmed to cycle at a constant 20Hz and only their duty cycle varies, from 0-100%. Higher Hz, say up to 35Hz can offer a smoother control of the valve (not essentially the boost) but a smaller operating window and less response. 20Hz is a good workable start point. Solenoids do not have a good resolution up to 10% or above 90% duty cycles. By programming the duty cycles in an opposing fashion and varying the pressure above and below the wastegate's diaphragm, very precise boost control can be achieved. 1. At the leftmost of the 21 programmed entries the Phase is Zero and the Antiphase is 100. Since the Phase Solenoid is at Zero duty cycle the top of the wastegate receives full boost. The Antiphase solenoid is 100% so it vents the area beneath the wastegate diaphragm. The result is the wastegate valve is pushed shut. Maximum boost. 2. At the rightmost of the 21 programmed entries the Phase is 100 and the Antiphase is Zero. Since the Phase Solenoid is 100% the top of the wastegate is vented to air. The Antiphase Solenoid is at Zero duty cycle so the area beneath the wastegate diaphragm receives full boost. The result is the wastegate valve is pushed fully open. No boost. 3. At the 11th entry both Phase and Antiphase are both at 50% duty cycles. In theory there is only spring pressure minus the backpressure effect on the valve area applied to the wastegate. Boost is dependant on the valve area and spring seat pressure. 1. Light wastegate springs are called for. In theory you do not need a spring but in reality you need a light spring to supply a force higher than applied to the wastegate's valve by the exhaust backpressure. People make the mistake of running heavy springs to get turbo response and boost, but you do not need them and you cannot control them. 2. It is very important to control the boost with correct wastegate size and spring pressure. Essentially, when the pressure target is correct, the wastegate should never be closed at any RPM, especially at high RPM and the wastegate duty cycle should be somewhere around 70%. If this is not achievable either the wastegate/spring combination is wrong or the turbo sizing is not correct. 3. PID Programming Advice: Introduce Proportional control first as Proportional is for immediate response. Intergral and Derivative can be zeroed out initially. Intergral can be introduced to modify error correction versus time, but be careful of Integral windup as it is against time. Lastly, Derivative is for fine tuning. 4. Braided stainless AN3 / AN4 boost lines are really fluid lines and not air lines and can abrade surfaces they are in contact with. EFI hoses can be used and are rated to about 275F. We use reinforced 1/4" silicone hoses that are rated to 500F. Silicone hose that is not reinforced is easily torn.